In The Church of Jesus Christ of Latter-day Saints (LDS Church), the Quorum of the Twelve Apostles (also known as the Quorum of the Twelve, the Council of the Twelve Apostles, or simply the Twelve) is one of the governing bodies in the church hierarchy. Members of the Quorum of the Twelve Apostles are apostles, with the calling to be prophets, seers, and revelators, evangelical ambassadors, and special witnesses of Jesus Christ. 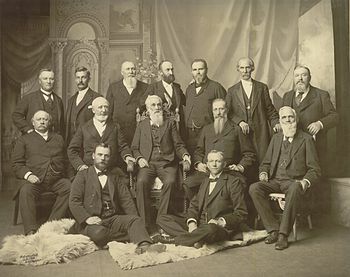 The quorum was first organized in 1835 and designated as a body of "traveling councilors" with jurisdiction outside areas where the church was formally organized, equal in authority to the First Presidency, the Seventy, the standing Presiding High Council, and the high councils of the various stakes. The jurisdiction of the Twelve was originally limited to areas of the world outside Zion or its stakes. After the apostles returned from their missions to England, Joseph Smith altered the responsibilities of the quorum: it was given charge of the affairs of the church, under direction of the First Presidency. The Quorum of the Twelve Apostles claims a leadership role second only to that of the First Presidency. At the time of the death of Joseph Smith, the President of the Quorum of the Twelve Apostles was Brigham Young. Young emphasized what he said was Smith's authorization that the Quorum of the Twelve should be the central governing body of the church after Smith's death. Then, in 1847, the Twelve reorganized the First Presidency with Young as President, and the Twelve took on a supporting role within a chain of command under the First Presidency, a role that continues to the present. Church policy decisions are made unanimously, with consultation among the First Presidency, the Quorum of the Twelve, and where appropriate, the Seventy, each of which has its own responsibility. Effort is made to ensure that the organizations are united in purpose and policy. Each member of the quorum is accepted by the church as an apostle, as well as a "prophet, seer, and revelator." Thus, each apostle is considered to hold the rights ("keys of the priesthood") to use all powers granted by God to the church. Individually and collectively, the Twelve Apostles hold the keys and have conferred the authority to exercise all of the keys upon the President of the Church. Thus, as outlined in the Doctrine and Covenants, only the President of the Church is entitled to receive revelation or dictate policy for the entire church. A major role of the Quorum of the Twelve Apostles is to appoint a successor when the President of the Church dies. Shortly after this occurs, the apostles meet in a room of the Salt Lake Temple to appoint a successor. Invariably the successor has been the most senior member of the Quorum of the Twelve Apostles, with seniority determined by the longest continuous duration of service. The apostles lay their hands on his head and ordain him and set him apart as President of the Church. The president then chooses two counselors in the First Presidency, who are high priests (usually apostles). The second most senior surviving apostle becomes the President of the Quorum of the Twelve Apostles. In cases when the President of the Quorum is simultaneously called to be a counselor in the First Presidency, or is unable to serve due to health considerations, an acting president of the quorum is called in his stead to fill the position. This has invariably been the most senior member of the quorum who is not a member of the First Presidency. As vacancies arise within the quorum, the Twelve and counselors in the First Presidency are invited to meet and counsel together in prayer in order to recommend names to the President of the Church as to whom will be called to fill the vacancy. The final decision rests with the President of the Church, but is formally voted on by the Twelve and the counselors in the First Presidency. The chosen man is generally ordained an apostle by the President of the Church, a counselor in the First Presidency, or the President of the Twelve. Depending on circumstances, this may occur before or after a sustaining vote is held at a church general conference. Any Melchizedek priesthood holder is eligible to be called as an apostle. Generally, new apostles have considerable experience in church government and have served faithfully as bishops, stake presidents, mission presidents, or seventies. As a matter of policy, apostles are generally asked to retire from their professional careers and devote themselves to full-time church service, including memberships of boards and professional organizations. Some apostles receive assignments to become members of boards of church-owned for-profit corporations and trustees of the church's educational institutions. (Some exceptions have been made to this rule, as when quorum member Ezra Taft Benson was permitted to serve as United States Secretary of Agriculture from 1953 to 1961 and when quorum member Reed Smoot was permitted to serve in the United States Senate from 1903 to 1933.) The calling of an apostle is typically a lifetime calling. Grandson of both Hyrum Mack Smith and Melvin J. Ballard; direct descendant of Joseph F. Smith and Hyrum Smith. A former president of Brigham Young University-Idaho. ^ As seen in this photograph, in September 1898 there were only 11 members of the Quorum of the Twelve Apostles (shown here with the three members of the First Presidency). Church president Wilford Woodruff had recently died and Lorenzo Snow left the Quorum to assume the presidency. Rudger Clawson would be called the next month, in October 1898, to complete the Quorum. ^ Doctrine and Covenants 107:25–27, 36–37. ^ Joyner, James (January 28, 2008). "Mormon President Gordon Hinckley Dies". Outside the Beltway (blog). Retrieved November 7, 2012. ^ Ostling, Richard and Joan (2007). Mormon America: The Power and the Promise. HarperCollins. p. 151. ISBN 9780060663728. ^ Due to quorum president Dallin H. Oaks serving as First Counselor in the First Presidency. ^ The Church of Jesus Christ of Latter-day Saints (January 16, 2018). "President Russell M. Nelson". MormonNewsroom.org. Baugh, Alexander L.; Holzapfel, Richard Neitzel (2010), "'I Roll the Burthen and Responsibility of Leading This Church Off from My Shoulders on to Yours': The 1844/1845 Declaration of the Quorum of the Twelve Regarding Apostolic Succession" (Subscription paywall), BYU Studies, 49 (3): 5–19. Bergera, Gary James (2010), "Church Organization and Government", in Reeve, W. Paul; Parshall, Ardis E. (eds. ), Mormonism: A Historical Encyclopedia, Santa Barbara, CA: ABC-CLIO, pp. 227–234, ISBN 9781598841084, OCLC 699490059. Bergera, Gary James (Spring 1992), "Seniority in the Twelve: The 1875 Realignment of Orson Pratt", Journal of Mormon History, 18 (1): 19–58 . Bushman, Richard Lyman (2008), "Chapter 4: Priesthood: How the Mormon priesthood is both hierarchical and democratic", Mormonism: a very short introduction, Oxford University Press, pp. 49–63, ISBN 978-0-19-531030-6, OCLC 179802646. Compton, Todd (Winter 2002), "John Willard Young, Brigham Young, and the Development of Presidential Succession in the LDS Church" (PDF), Dialogue: A Journal of Mormon Thought, 35 (4): 111–134. Ehat, Andrew F. (1982). Joseph Smith's Introduction of Temple Ordinances and the 1844 Mormon Succession Question (MA thesis). Department of History, Brigham Young University. OCLC 9417550. Esplin, Ronald (Summer 1981), "Joseph, Brigham and the Twelve: A Succession of Continuity", BYU Studies, 21 (3). Flake, Lawrence R. (2001), "The Quorum of the Twelve Apostles: An Introduction", Prophets and Apostles of the Last Dispensation, Provo, UT: Religious Studies Center, Brigham Young University, ISBN 1573457973, OCLC 46943088. Heath, Steven (Summer 1987), "Notes on Apostolic Succession", Dialogue: A Journal of Mormon Thought, 20 (2): 44–57. Holzapfel, Richard Neitzel (2010), "The Prophet's Final Charge of the Twelve, 1844", in Holzapfel, Richard Neitzel; Jackson, Kent P. (eds. ), Joseph Smith, the Prophet and Seer, Provo, UT: Religious Studies Center, Brigham Young University, ISBN 9780842527538, OCLC 495616860. Mecham, Travis Q. (2009). Changes in Seniority to the Quorum of the Twelve Apostles of The Church of Jesus Christ of Latter-day Saints (MA thesis). Department of History, Utah State University. OCLC 696332667. Nelson, William O. (1992), "Quorum of the Twelve Apostles", in Ludlow, Daniel H (ed. ), Encyclopedia of Mormonism, New York: Macmillan Publishing, pp. 1185–1189, ISBN 0-02-879602-0, OCLC 24502140. Quinn, D. Michael (Winter 1976), "The Mormon Succession Crisis of 1844", BYU Studies, 16 (2). Quinn, D. Michael (1994), The Mormon Hierarchy: Origins of Power, Salt Lake City, UT: Signature Books, pp. 143–262, ISBN 1-56085-056-6. Quinn, D. Michael (1997), The Mormon Hierarchy: Extensions of Power, Salt Lake City, UT: Signature Books, pp. 21–65, ISBN 1-56085-060-4. Turley, Richard E., Jr. (2005), "The Calling of the Twelve Apostles and the Seventy in 1835", Joseph Smith and the Doctrinal Restoration: the 34th Annual Sidney B. Sperry Symposium, Provo, UT: Religious Studies Center, Brigham Young University, ISBN 1-59038-489-X, OCLC 60589119. Walker, Ronald W. (2004), "Grant's Watershed: Succession in the Presidency, 1887–1889", BYU Studies, 43 (1): 195–229.